Fort Myers and Cape Coral listing inventory down 9.2% in the latest data released by Florida Realtors. To be fair, this data includes more than just Fort Myers and Cape Coral. It includes single family homes in all of Lee County, but since Fort Myers and Cape Coral are the two largest cities, that’s how the headline reads. 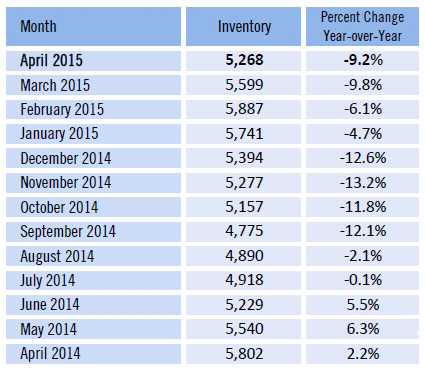 If new listings are up 6.1% over last year, you might be asking how listing inventory is down 9.2%. New listings have been up for several months in a row now. 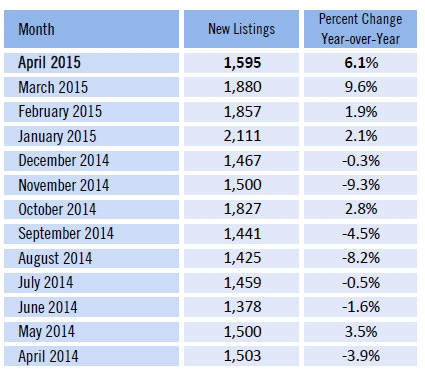 The answer is while new listings are up, new pending sales are up 10.2% in April and 17.7% in March. New listings are hitting the market, but demand is soaking them up before they can linger on the market. This tells us that demand is out-pacing supply. Agents complain that there just isn’t enough inventory and they’re correct. We have inventory, it’s just that it’s not enough for the demand. As you can tell we’re into graphs as they tell a story visually that sometimes gets lost in the raw numbers. Of course, we only have so much room in the article or we’d fill it with all graphs and no explanation. Buyers have been into our office desperate to find homes in their price range. One way buyers can find out about new listings that hit the market is to search online. Our website has a feature whereby if you login and save your search the system will email you listings that match your criteria. You can save the listings that interest you, but the best part is when a new listing hits the market that matches your criteria the system will notify you. Buyers love being notified when new properties hit the market. They get a leg up on the competition. Unlike some of the national websites, our information includes all the listings that brokers share with each other and its updated daily. Some of these national websites have old data or not all brokers participate. Remember, it’s the individual brokers who decide where the listing data is displayed, not these national companies. This is probably why buyers get upset when they find properties online only to find out it’s been off the market for awhile. That is frustrating. These national websites come in and spend a ton of money online promoting their websites so it’s hard for buyers to know which sites are the best ones to search on. They typically search whoever is listed at the top of Google or Bing not knowing that website may not have accurate or timely data. I’ve been seeing new national websites popping up weekly now. All they are trying to do is scrape data from the MLS or wherever they can get it, attract buyers through online advertising, and then sell ads to brokers. Why not go straight to the source and get the best data directly from a broker? Sellers like our website too because they can find the value of their home through our home valuation tool. Sellers too can be on the lookout for new listings because many times they want to find a property to buy before they decide to sell. Having a local broker who knows the market is gold versus a website that sends your lead out to multiple agents who may or may not be active in your market. Posted in Cape Coral, Cape Coral Real Estate, Fort Myers, Fort Myers Real Estate, Southwest Florida Real Estate.Tagged Cape Coral Listing Inventory Down, Fort Myers Listing inventory.